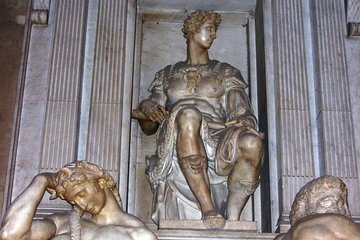 Learn about the powerful Medici family on a private 3-hour tour of the Medici Chapels at the Basilica of San Lorenzo. Built in the 16th and 17th centuries, the ornate chapels feature some of Michelangelo's sculptures and first architectural works, along with the marble-lined Chapel of the Princes (Cappella dei Principi) and more. Meet your guide after making your own way to the Medici Chapels complex in the Basilica of San Lorenzo. Your guide shares informative commentary about the site as you see the crypt, the Mausoleum of the Princes, and the New Sacristy — a Michelangelo masterpiece commissioned by the Medici family. Other famous artists also worked on the chapels, including Ghirlandaio, Della Robbia, Perugino, Raphael, and Sansovino. See the celebrated Michelango statues, Day and Night, and Dawn and Dusk, and Brunelleschi's rebuild of the Basilica of San Lorenzo, which houses sculptures by Donatello. Hear stories about the grand dukes of Tuscany that were buried here, along with other lesser-known members of the Medici family.